With the latest in tire technology, Continental has rolled out the Continental CrossContact LX tire. Developed for all-season use, this touring tire fits most any SUV, light truck, crossover or minivan. The tire itself sports an asymmetric tread pattern which provides a larger contact patch leading to increased road handling and stability across varied terrains. The ride is truly a comfortable one that befits todays luxury vehicles. When you look closely at the tire you will find that it has progressive interlocking sipes which result in excellent traction in all seasons and road conditions. Tapered groves encompass the circumference of the tire and go a long way in keeping you safe when traveling on wet roads. It also reduces the risk of hydroplaning. A side benefit is that small stones and gravel do not get stuck in the tread like they do in other tires. The CrossContact LX has a strong circumferential rib with a notched shoulder that provides better overall steering response behind the wheel. Continental has uses its Acoustic Alterra Technology to ensure a noiseless ride and great comfort. This means that you can easily make yourself heard at high speeds on the highway. In fact it is one of the quietest tires in its class. Continental utilizes a highly advanced tri-net silica compound which works well in a variety of road conditions. 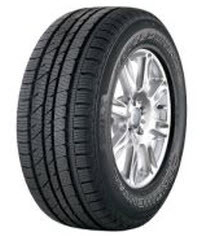 Whether you drive in dry, wet or cold weather this tire is gets you there regardless of weather conditions. Inside the tire you’ll get twin steel belts and a polyester cord body for additional strength and riding comfort. The Continental ContiCrossContact LX Tire is available in a choice of black or white lettering on the sidewall depending on the size. They have also added a flanged lower sidewall design so that you won’t get your rims damaged from getting too close to curbs or other obstructions. Overall, the Continental CrossContact LX tire provides more than adequate performance on dry or wet road surfaces. The ride is comfortable and you get a 65,000 tread warranty. Prices for the Continental ContiCrossContact LX Tire range from about $105 for the 15 inch tire to approximately $221 for the 22 inch tire. Here’s a quick video on how this tire goes through snow covered roads. Who Are Continental ContiCrossContact LX Tire Designed For? Continental Tires backs up the CrossContact LX with a 6-year or 65,000 mile warranty. There is also a one year or first 2/32 inch of wear guarantee on the tire’s uniformity. Materials and workmanship are covered for 6 years and provide for free tire replacement during the first year or first 2/32 inch of wear. Cooper follows this up with a prorated amount for the remaining time period or until there is 2/32 inch of useable tread left on the tire. A one-year or first 2/32 inch of wear road hazard guarantee is also included with the Cross Contact LX. Finally, you get a 30-day customer satisfaction guarantee whereby you can exchange the tires for another Continental model.